Who doesn’t love pizza, the Italian pie that is now an American staple dish? But finding a good, healthy frozen pizza option is next to impossible. And who has time to make their own? Very few people have the luxury of time, which I think is one reason that so many people choose an unhealthy diet and lifestyle – convenience. I have posted before about the spinach topped pizza that I am crazy about. I have recently discovered a few other pizzas that are equally as delicious and just as healthy. AC La Rocca Pizzas provide a whole lot of goodness and tons of taste too so that you can serve pizza to your family without all the guilt. These pizzas feature all natural, organic ingredients and are available in a good number of varieties. I’ve tried a couple of them and plan to try them all over time, but for now I am in seventh heaven after eating the Ultra Thin Sprouted Grain Bruschetta Style Pizza. This thin crust pizza features all nature mozzarella, feta cheese, parmesan, organic tomatoes and garlic, and the goodness of a crispy and organic sprouted grain crust that is not only yummy on the outside but also like fresh bread on the inside. It is nearly impossible to find a frozen pizza as healthy as this one. 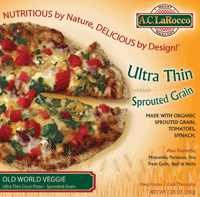 The Bruschetta pizza from AC La Rocco has just 340 calories for the whole pie with 16 grams of fat, and 2 grams of fiber with no trans-fats and 22 big grams of protein (so 8 weight watchers points for what is actually listed as a two serving pizza). Other varieties of the super thin crust low calorie pizzas include Old World Veggie and Garlic Chicken. Super yum, huh? Love pizza and are still looking for other great options? Check out my previous postings on doughy pizza pretzels, my favorite pizza sauce, low calorie tortillas as a pizza crust substitute, health is wealth pizza munchees, and my recipe for pizza on english muffins. This is actually my favorite pick for a frozen pizza!